The village of Whitbourne lies midway between Worcester and Leominster in the Herefordshire countryside and is almost unknown to the big wide world. Yet it was the setting where, in the years between 1603 and 1620, Francis Godwin wrote the first ever science fiction book (though not published until 1638 after his death), The Man in the Moone. Some 50 years before Isaac Newton watched the apple fall and "discovered" gravity, Godwin described in the book "... a secret property that pulls things towards the earth, but which get weaker with distance and has no power in space ...". Gravity !!!! In fact Godwin lived and wrote his book in the house next door to the Church! He was, after all, Bishop of Hereford and the "house next door" was in fact the Bishop's Palace. As is the entitlement of a Bishop, Godwin is buried within the Church. Interestingly, a recent mug we have made is for Wycombe Astronomical Society, which was designed by a descendant of Francis. Less well known is that Whitbourne is home to Kit Harrington aka Jon Snow in "Game of Thrones", one of the biggest television series in the World. Good see the little boy my kids grew up with on the front cover of magazines, on the side of London buses and starring in major movies (such as Pompeii and Spooks) as well as on the stage (before he found fame in Hollywood Kit was in the original stage production of "Warhorse" and is regularly in productions of his first love - live theatre). The other thing that puts Whitbourne on the map is Whitbourne Mugworks. Want to know more about Whitbourne Mugworks? Based in the village community, Whitbourne Mugworks is a typical small business where there are no set working hours other than all day and all night and where most of the time you will reach a human being if you telephone us (though occasionally you'll reach the answer phone and we'll call you back as soon as we can). The principle of the business is Keith Butler, supported by his accountant wife Lynn who is sometimes referred to as "the accounts lady" in our correspondence. She keeps the books straight. Keith has a long sporting pedigree having worked for MCC at Lord's, Worcestershire County Cricket Club, has merchandised for Goodyear in Formula 1 and was Commercial Manager at Gravesend and Northfleet FC (long before it became Ebbsfleet United), Rochdale, Hereford United, Cardiff City and Wolverhampton Wanderers Football Clubs (having also worked at Millwall and Swindon Town). As if that isn't enough he also built and ran the Cricket Shop at Edgbaston for Warwickshire County Cricket Club over a ten year period - and where he was responsible for the famous King of Spain mug. Tired of constant commuting on the M40 while at Lords he decided to work closer to home. He now is the owner of Whitbourne Mugworks which he has run since 2008. 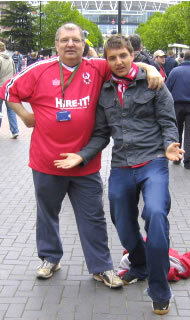 Our picture shows Keith and son Adam supporting their football team at Wembley (some years ago now!!!). Can you work out which Club they are supporting - answer is revealed on the Personalised Mugs page. Adam and oldest son Simon occasionally help in the business, all the time learning the trade before it comes the time when the "old man" retires .... he expects around 2053 when he'll be 100 yo. Since we launched the business, our core product has been the WYCOMBE RHINO COATED MUG in what is commonly known as a DURHAM shape, featured above which is still the basis of our supplies and our best seller. That is now joined by the almost identical DURAGLAZE MUG which offers the plain white, two tone coloured and coloured rim and handle variations. These are all high quality mugs produced in the far east (our mugs are mainly produced in Thailand) and printed at our works in Herefordshire. You may ask why two types of similar mug? In truth they have slightly different dishwashing properties, packaging differs, Duraglaze offers the colours option and of course price is a consideration. But no business should have all it's eggs in one basket so it is just common sense to have two suppliers up our sleeves. We also offer a PORCELAIN MUG and a BONE CHINA MUG to make up a full range of styles, price offers and qualities. 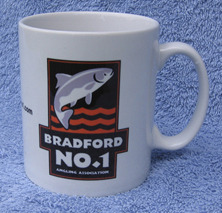 If you would like to know more about the range of mugs we can supply please visit out 'About Mugs' page. (click on the highlighted words to go to the page). We print mugs by a method called sublimation. If you would like to know more about Sublimation click on the highlighted word or find it via the header bar at the top of this page. You can order Promotional mugs for your club, business, organisation, etc or even individual personalised mugs. We mention a few times on this site that we operate from the Countryside rather than a town or city? No reason really other than it is a lifestyle choice that, we hope, reflects a little bit about ourselves. We don't overplay it but we are as eco friendly as possible, making as little harmful impact on the environment as we possibly can. Our world is important to us so we recycle (including when we can, re-using the packaging that your mugs are delivered to us in, to send on to yourselves), try to work as paper free as possible and indeed try to be a fuel efficient business. We recycle water and avoid chemical pollution (including printing inks) into our drains. We don't have a cottage with roses around the door - our premises are in fact quite modern - but it is a calm way of life, where we will occasionally get the smell of the farm rather than car exhausts, the sound of a tractor rather than the police siren and occasionally get cut off by flooding. We are often visited by interesting creatures that will distract us for a few minutes (including a chicken wandering in when the door is open) - but with our way of life we do have that few minutes. We have a fairly old fashioned approach to business that seems to get lost in the hustle and bustle of the modern City - and yet are fully up to date in operations, reflected in our use of IT and the internet. It's a lifestyle we have chosen for the family and the workplace. No big deal - we just think it's worth saying. We hope you enjoy looking through our website. Don't forget to look at our amazing, extensive gallery too!